Istanbul, formerly Constantinople, is a magical city. Mosques with Disney-style minarets dot the skyline while the syncopated calls to prayer drift from competing muezzin throats, aided by speakers to carry their call through the air. It’s eerie and beautiful, much like the city itself. And the food. Oh the food! Living in Israel, the flavors were familiar and I realized just how many Israeli dishes are Turkish in origin. Turkish cooking is all about a perfect balance of spices, mostly blends that leave you trying to guess at their composition. The city is inexpensive as a whole and the food is cheap and downright delicious. 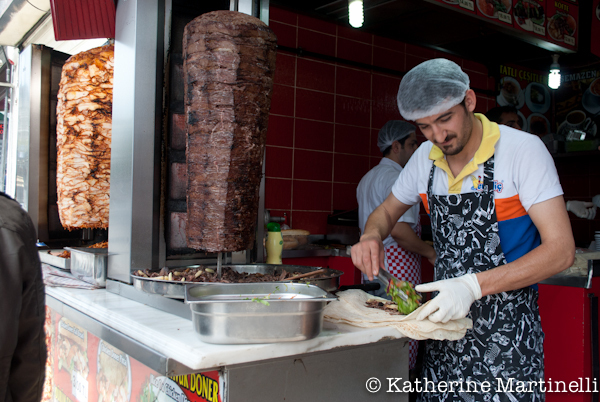 I love any city that boasts good street food and I encountered some of my favorite in Istanbul. Men at carts sold roasted chestnuts, boiled and grilled corn, various breads, brightly colored pickles, meat kebabs, rice pilaf, and fresh fish sandwiches. The city has a vibrant culinary scene, offering everything from wonderful laid-back taverns with plentiful meze and raki to high end, chef-driven restaurants where you can enjoy a fancy meal. We ate in all kinds of places all over the city and didn’t have a single bad meal (well, there was one…but I’ll get to that later). We stuffed ourselves on Turkish delights and more kinds of baklava than I ever knew existed. 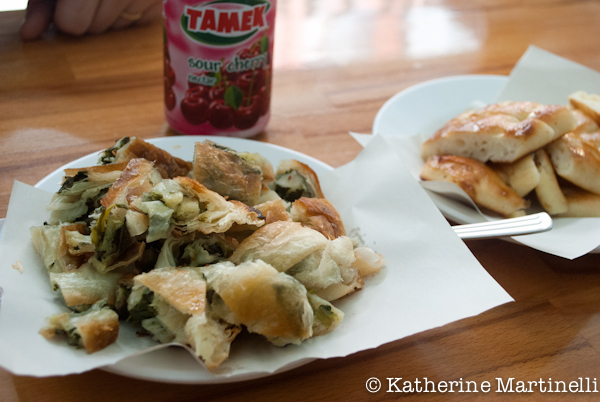 We ate borek and Turkish “pizza,” meze and manti, and so much more. We also took a cooking class, which I will tell you about another day. 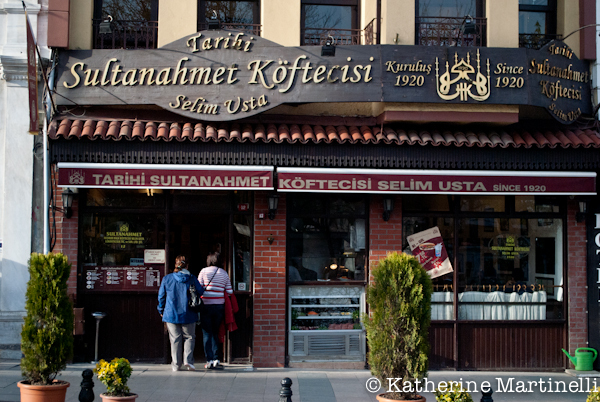 This was our favorite find, and one of our best meals in Istanbul. We stumbled upon it while walking up the big hill in Beyoglu and decided randomly to explore a dark side street where children played and there appeared to be a few cafes. 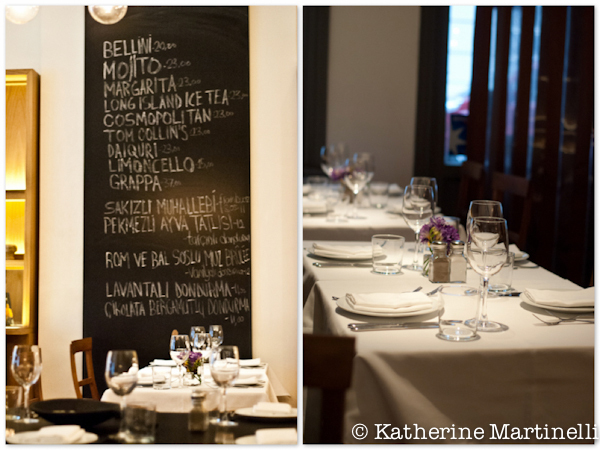 As soon as we saw Açik Mutfak, which means Open Kitchen in Turkish, we knew it would be a memorable dining experience. The tiny restaurant has only seven tables and can probably accommodate about 22 people. The modest kitchen is at the very front when you walk in, and the meze are laid out on the counter, tempting you in. The restaurant smells delicious, and you get the sensation that you’ve just walked into someone’s home for dinner. When everybody you know who lives in or has ever been to Istanbul tells you to go to the same restaurant, you listen. For me that restaurant was Ciya Sofrasi (pronounced chia sofrasi), a ferry ride away on the Asian side of Istanbul. After such hype you can imagine my surprise to find a casual, unpretentious restaurant waiting. Although they have menus, the waiter took us to the front where a cook was surrounded by 20 or so pots and pans filled with traditional Anatolian food. After he described each dish we chose six (many half portions) to share between three of us. We also began with the salad/meze bar, where you help yourself and then pay per weight. My ridiculously full plate cost a mere 6TL, and had a veritable rainbow of both familiar and unfamiliar meze dishes from stuffed grape leaves to spicy bitter greens. If you like fish then you can’t leave Istanbul without trying one of the fresh fish sandwiches (balik ekmek) near the Galata Bridge. Everyone will tell you to go to the brightly lit boats on the Eminonu side of the Galata bridge. Here, you will find three different establishments selling the sandwiches for 5TL and nearby stands selling neon-colored pickles for an additional 1.50TL. The sandwiches here were good, the atmosphere was fun, and they offer seating, but our favorite fish sandwich (also 5TL) was just on the other side of the bridge next to the fish market. There stands a lone guy with a grill and a beautiful set up of vibrant accoutrements like tomatoes, lemons, and greens. 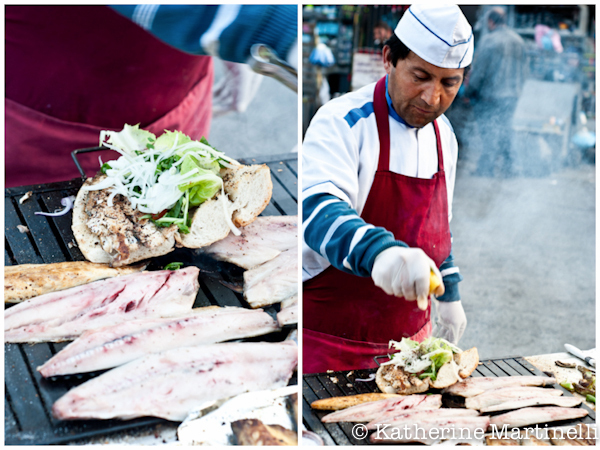 He grills the mackerel in front of you, all the while carefully scraping away the tiny bones. He then squeezes lemon and sprinkles spices over, toasts the bread, adds tomato, onion, lettuce, and grilled HOT pepper. It’s just incredible – simple, fresh, and delicious. 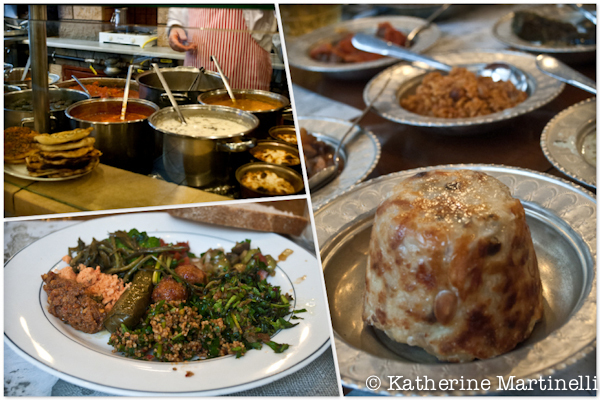 I’m not joking when I say that this was one of our top eating experiences in Istanbul. We don’t keep kosher, but as someone who lives in Israel and writes about Jewish food I was intrigued by Istanbul’s lone kosher restaurant, Levi Lokantasi. Although it’s right near the spice bazaar, we had trouble finding this slightly hidden restaurant so allow me to save you some time: find Hamdi restaurant, which is a multi-story restaurant with neon signs and famously arrogant waiters that will likely be in your guide book. Levi is down the block in the opposite direction from the spice bazaar and not obviously marked. Look up to see “Kosher Levi” written in the window and head up a set of stairs that looks like a service entrance. Our family friends who I mentioned earlier recommended this gorgeous, modern Turkish restaurant to us. Situated down the block from Karaköy Güllüogu, not too far from the Galata bridge on the Galata Tower side, it’s easy to get to while also slightly off-the-beaten-path. Much like the food, the décor is modern with rustic touches – one wall is covered in whole walnuts behind mesh; the cocktails and specials are written on chalkboards and mirrors; plain black tables are contrasted with stunning wood chairs; bulbous light bulbs float from the ceiling. The chef, Didem Senol, went to culinary school at New York’s French Culinary Institute before returning to her native Istanbul to cook Aegean and Anatolian cuisine. Phew! Thanks for bearing with me on that one – I know it was long! Have you been to Istanbul? What’s your favorite foodie destination? Totally awesome. I was in Turkey about ten years ago, right after graduating from high school. It was a really amazing place, and the food blew me away in quality. I never managed to match it in NYC Turkish restaurants. Guess I should just go back. That’s awesome that you were able to visit – definitely time to return! I will be scouring New York for some decent Turkish food this summer, but my guess is none of it will come close. So much great-looking food! This is a region I’ve never spent any time in, and I would really love to go. It’s just incredible! I totally fell in love with Istanbul and would love to travel more in Turkey. Thanks Anita! Glad you enjoyed! How I wish to visit there some day. Your pictures just tempted me so. Thanks so much for sharing, Kat. Istanbul was incredible, I hope you have a chance to visit! Gorgeous pictures! 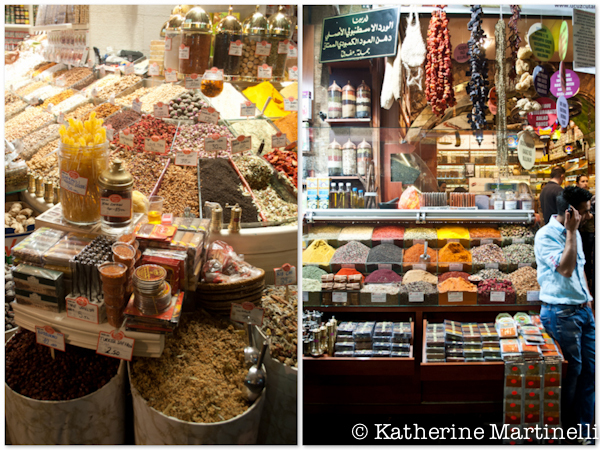 🙂 i haven’t been to Istanbul, but those spice markets remind me a lot of the souks in Morocco, which were amazing. Thank you Kiri!!! Oh how I long to visit Morocco!! That is definitely on the top of my list. 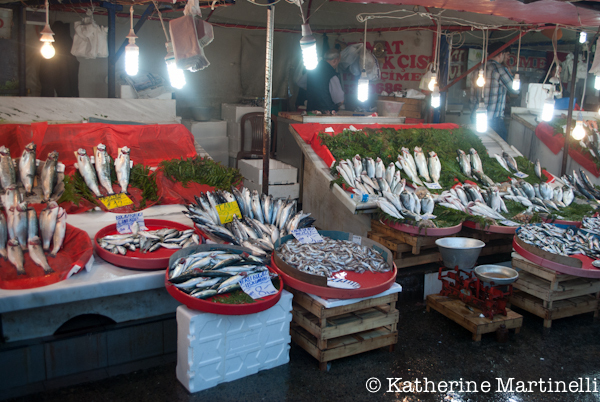 I have never been to Istanbul but it looks like a top destination for a foodie traveler. I love the collections of spices! And the platter with baklava – to-die-for! Thank you so much for sharing! It really is a food lover’s dream! Between the incredible markets and sensational food, it’s just heaven. Not at all!! I could eat it any time of day. So cool that your parents visited Istanbul! Amazing! The Blue Mosque is GORGEOUS!!! Even from pictures I’m moved by how beautiful it is, I can’t imagine looking at it in person. And all the food is really new to me and I wish to try them all. The fish sandwich looks fantastic! My brother has been to Istanbul and I have seen his pictures. Hmm I should have traveled more! Either married too young or had kids too young?! Haha! Thank you Nami! Haha I know what you mean – I am trying to travel as much as possible before having kids! I want to go everywhere. I’m going to be honest here. You know how I roll. I have never been more jealous of you in my life. There, I said it. Please trade lives with me for a week or two or ten. You’re killing me here Katherine! The pictures, the descriptions of all that food, the restaurants, the town – WOW! What a heavenly trip! Thanks so much for sharing ALL of this! I’ll never make it to Istanbul, but you’ve made me feel like I’ve at least eaten there! 🙂 Thoroughly enjoyed this post! Aw thanks MJ! I am so so so happy you enjoyed this post 🙂 It really was a memorable trip. All I can say is WOW, the pictures are gorgeous, the food looks amazing and I really really really wish I was there, hope you have a great time! Thank you for sharing these photo’s. All the people who mentioned visiting Istanbul always have good things to say. It’s my pleasure Debra! I’ve also only ever heard wonderful things, and I completely agree! Thanks Lori! I will certainly be dreaming of that fish sandwich for a long time to come. Oh Katherine, what an fabulous post! Your photos are outstanding, and I especially love the shot of the Blue Mosque. 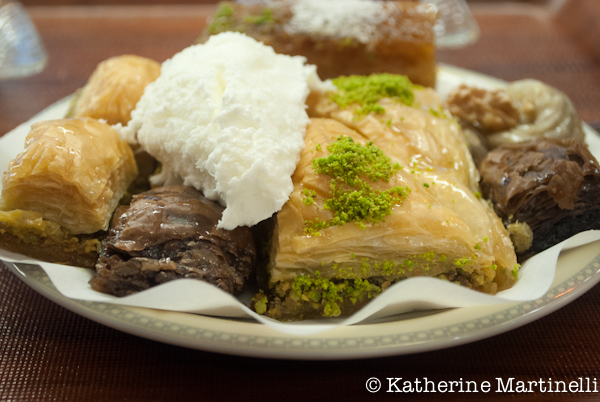 I’m drooling for a bite of that pistachio baklava and remembering our ( not so ) recent trip. Istanbul is one of my favorite cities and you certainly brought it alive for everyone. I’m definetely keeping a list of these restuarants to try for next time! Looking forward to seeing all those Turkish spice inspired recipes! Thank you Judee! I’m so happy to have brought back memories of your trip. 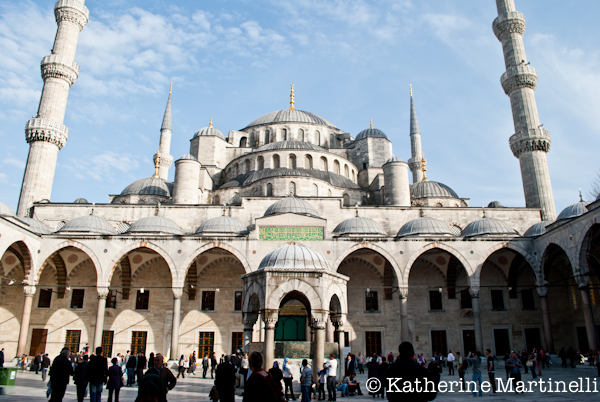 Istanbul has become one of my favorite cities as well – it’s hard not to fall under its spell! Great post! I’ve never been to Istanbul, but it’s one of those cities I very much would like to see. Sounds like a wonderful place! Thanks! It’s really incredible and I know you would enjoy it for the food alone. Thank you for all these nice compliments about my country..
Istanbul is really special city..But you should see the south which about all beaches in Meditearrean..Taste is different…mostly fresh herbs and seafood…. I would love to! I really can’t wait to return to Turkey and explore the country further. hi katherine, ı saw our photo on your webpage. thank you very much for this. we need your help also. we have new restaurant next to semazen. It names semazen kebab grill. we need advertisement so we need to attract attention people. what can we do for this. How can you help us. Thanks for reaching out Can! Very exciting that you have opened a new restaurant. I’m not sure how I can help you, but I’ll shoot you an email 🙂 Best of luck! Güllüogu has made it to NYC (or, they’ve been here for quite a while now. Still wondering about that…), which is a bit dangerous considering there’s more than one! So, if you’re ever by 52nd and 2nd or in Brighton Beach, they’d make a good pit stop. But, since you live in Israel, I’m sure you get your fill of the honey and phyllo dough a bit more often! 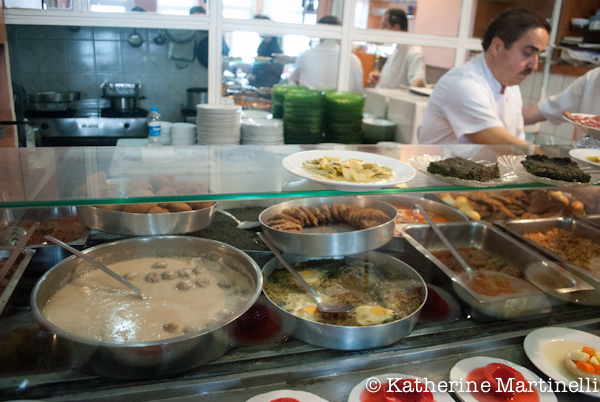 I’ve been to Turkey a few times, but one food I didn’t know about before going there was künefe. That’s consistently a food worth trekking 8050 kilometers to eat. I had read that there was a Gulluogu in New York – I can’t wait to try it when I’m home! We do get pretty good pastries here, especially kunefe actually – isn’t it amazing?! But nothing beats Istanbul. I read your review of the Peder Pilav at Çıya Sofrası–the “chicken, rice, currants, and almonds encased in a thin layer of pastry.” For me it was so extremely delicious. I would have preferred the doughy pastry to be flaky puff pastry, but what’s inside was just heaven. I am Asian and the taste reminds me of very good Chinese chicken rice. The almonds and currants really add to the flavor and texture profile.